Last weekend, Class in Action had its twelfth edition in Prague. 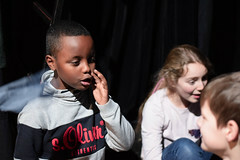 For three days, students of various nationalities rehearsed, competed, and devised short plays, all of which were performed at Divaldo Na Pradle. This year, theatre schools from England, Ireland, France, Russia, and Poland, had to come up and devise a full play based on one of the following themes: ‘Trick’, or ‘Reap what you Sow’. Needless to say that those themes opened doors for various interpretations. From reality shows to dystopia, cyber-bullying and disfunctional families, the students definitely proved they had an endless imagination and a talent for creativity and blocking their plays. PYT Plus group even performed as well, but not as contestants. After PYT’s tremendous success at Class in Action last year, the group performed an exhibition extract from 26 Pebbles by Eric Ulloa, a play they will continue to develop until the main public performance in June. Anyway, after two days of intense rehearsal and performance, it was time to relieve all that stress. All groups gathered at Paralelni Polis to participate in open-mic games and start working on theatre workshops. This was the perfect opportunity for the students to get to know each other and form bonds. During the next day, the newly-formed groups kept on putting together their new short plays, which were then performed at Na Pradle. But this time, no stress: only fun and games ! And finally, Class in Action ended on Saturday with the awards ceremony everyone was eager for. It was tough choosing a winner for each category, but the jury eventually managed to come to a decision. Missed the results ? Check them out here ! Congratulations to you all! And remember, expressing such creativity and bringing to life a whole play is a victory in itself! You are all winners, and we look forward to seeing many more talented students and amazing plays next year. Previous Post My First Day at PYT: A Baptism of Fire!